Jane Yolen and Jason Stemple join forces again in this new winning combination of poems and photos. Water possesses reflective qualities, creating fascinating patterns and doubled images that allow us to see things in new ways. 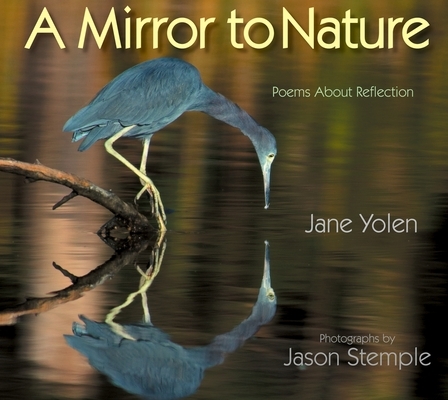 Celebrated writer Jane Yolen and photographer Jason Stemple capture these natural beauties in twelve thoughtful poems and breathtaking pictures in this winner of the John Burroughs Nature Books for Young Readers Award. Watery reflections provide an appropriate backdrop for Jane's musings on nature, such as a raccoon swimming with his reflected self, the water-jagged legs of a snowy egret, and the double danger of a hungry alligator at the edge of a swamp. Jason's photographs offer whimsical peeks at the natural world we rarely chance to see. This artistic collaboration gives readers a unique opportunity to contemplate their world. Jane Yolen has received numerous awards for her writing, including the Regina Medal, the Society of Children's Book Writers Award, and the Christopher Medal. Her books have been translated into more than twelve languages. She lives in St. Andrews, Scotland and Hatfield, Massachusetts. Jason Stemple is a freelance photographer. He has provided the photographs for a number of poetry books for young readers, including Fine Feathered Friends and Wild Wings, both written by his mother, Jane Yolen. He lives in Charleston, South Carolina.